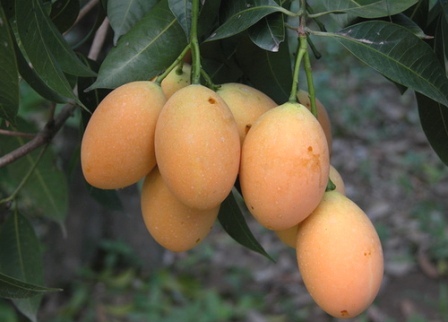 Other names: Maprang, gandaria, plum mango, marian mango, ramania, kundang. Gandaria is native to Malaysia and Indonesia. 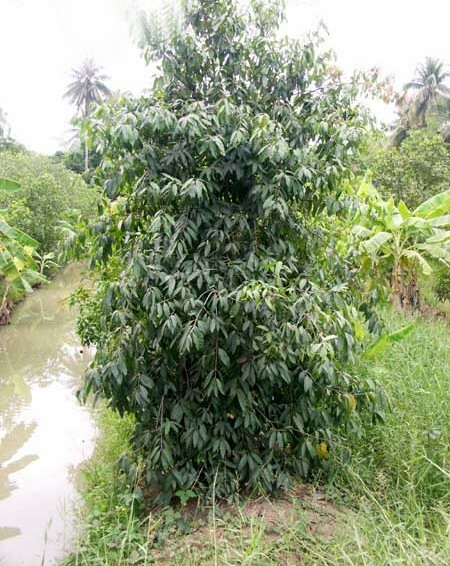 It is cultivated as a fruit tree, widely in Sumatra, the wetter parts of Java, Borneo, Ambon as well as Thailand. Probably it is commercially most important in Thailand. A large tree, up to 27 m tall, with light brown fissured bark and often with pendulous, glabrous, angular or flattened branchlets. Leaves ovate oblong to lanceolate or elliptic, 14-30 cm x 5-8 cm, decussate, simple, coriaceous, shining, entire, base acute to cuneate, apex acute to acuminate; petiole 1-2.5 cm long. Inflorescences axillary panicles, 4-12 cm long. Flowers mostly tetramerous, small; calyx lobes broadly ovate; petals oblong to oblong to obovate, 1.5-2.5 mm x 1mm, yellowish, soon turning brown. Fruit a drupe, sub-globose, 2.5-5 cm in diameter, yellow to orange, fleshy juicy consistency, glabrous, sour to sweet with a characteristic faint smell of turpentine. 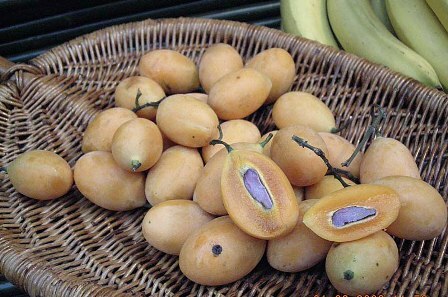 Gandaria fruits, especially the sweet varieties, are consumed fresh or eaten cooked in syrup. Entire immature fruits are chopped and used as an ingredient in the spicy condiment sambal, and are pickled to prepare asinan. Young leaves are also consumed in salads and eaten with sambal. Fruits of gandaria are sold in market. In Jakarta, gandaria occasionally equals the best mangoes in price, especially when it is not peak season. Gandaria is tree of the humid tropics and thrives best in light and fertile soil. It occurs naturally in low land forests below 300 m altitude, but has been successfully cultivated up to elevation of about 850 m.
Gandaria is normally grown from seed but it can also be easily propagated by air layering. Grafting is also possible. Seedlings or clonally propagated plants are planted in rows at spacing of 10m x 12m and need shading for several months. Boosting the growth rate in the early years with manure, urea and other fertilizers is recommended to shorten the vegetative period. Normally the first harvest from seedlings can be obtained 8-10 years after planting or after 5-6 years from vegetatively propagated plants. The fruits of cultivars (Indonesian) Ramania Pipit and Ramania Tembaga have red flesh and are pleasantly sweet. However, fruits of Hintalu, very sour. Mayong Chid is a sweet cultivar with yellow orange fleshed fruits. A mature tree may produce as much as 200 kg fruit in one season. So it can be a quite remunerative fruit. Gandaria is a decorative shade tree bearing sweet, tasty and attractive fruits. The fruits are not only eaten fresh but are used for making popular products too. All these qualities make gandaria not only a valuable tree for home gardens but for commercial cultivation too. Gandaria should therefore be promoted as a commercial fruit crop.